At Baltimore’s The Center, church groups from across the U.S. work with outreach ministries of local congregations while learning about the theology of missions and the root causes of poverty and racism. Organizers hope they will apply these lessons in their home communities. On a Monday evening in late June, about two dozen teenagers from Georgia and Iowa shuffled into a large room at The Center, a Baltimore program that facilitates mission trips from churches across the country. The scent of their just-finished dinner -- spaghetti and meatballs with garlic bread -- still wafted through the 200-year-old brick building. In the 48 hours since their arrival, the teens had made a good start at typical mission work, serving as counselors at day camps for children in some of the city’s low-income neighborhoods. They’d played board games, supervised simple science experiments and met children with lives very different from their own. But under the guidance of Center staff, they had also toured the city on foot and by car, looking at the sharp lines that divide Baltimore’s rich and poor, black and white. It’s not a typical approach to Christian missions and outreach, but it’s a critical part of The Center’s work. An innovative mission program launched seven years ago by the Presbytery of Baltimore, The Center hosts church groups from throughout the United States, connecting them with Baltimore churches engaged in outreach ministry in the city. At The Center, the volunteers not only do good works; they also immerse themselves in the theology of missions and the social and economic roots of poverty and racism. The program’s goal is to equip the visiting groups with knowledge and insight they can take back home to address issues of race and class in their own communities, said the Rev. Kate Foster Connors, The Center’s executive director. After gathering the teens that Monday evening, The Center’s staff led them in a discussion about their first impressions of the city. The teenagers brainstormed a list of boundaries, half-shouting to be heard over the struggling air conditioner. What are the lines and boundaries in your city? In your church? Fences. Personal space. Laws. Gender. Social class. Education. Age. Religion. Race. Ever since the apostles set off to make converts, Christian missions have required crossing boundaries -- borders, oceans, differences in language, culture, ethnicity and more. Over centuries, missionaries traveled the globe, bringing Christianity to new countries and cultures, but often at great cost to traditional cultures. In the worst instances, missionaries tortured -- or even killed -- those who would not convert. Today, many congregations include short, focused mission trips as part of their outreach ministries. Typically, teens or the occasional group of adults might build chicken coops in Nicaragua, pour concrete for a school building in Uganda or stabilize sagging homes in Appalachia. The focus is not conversion but service, with prayer and Scripture woven through the experience. Yet the words “mission trip” can sometimes seem tarnished, Foster Connors said. Even with the best intentions, the trips can have an implicit arrogance about them. The missiongoers -- often white and affluent -- are “giving” to others who, by the very nature of the missions, inescapably seem less, she said. Mission trips at The Center aim to be different. Yes, the visitors do good works, laboring alongside local residents and church members and getting to know people they wouldn’t have met otherwise. But they also learn about the long history of racial and economic oppression that has shaped life for many in Baltimore. They work with local congregations already engaged in mission work in the city. And when the trips go well, they return home with a new awareness of barriers in their own town and ideas on how to begin to dismantle them. Maps tell mission groups about the lines that divide Baltimore’s rich and poor, black and white. Photo by Lisa Howell and Tracy Watts. The program traces its roots back to 2009, when the Baltimore Presbytery convened a group of pastors and other leaders from Presbyterian Church (U.S.A.) congregations in the city to talk about creating an urban mission center. For years, many pastors had received calls from church groups nationwide wanting to come to Baltimore to help people affected by poverty, drugs or violence. But other than referring the groups to a local nonprofit, the pastors were usually at a loss to respond. Opportunities for meaningful volunteer experiences were few, and their churches did not have space for large groups to sleep, shower and eat. The task force members wondered, what if the mission groups came not to “fix” Baltimore or “save” people but to learn and build connections with people unlike themselves? Rather than being referred to local nonprofits, what if the visiting groups were paired with local congregations already engaged in broad-based community ministry? How can your congregation better connect with people unlike themselves? After more than a year of planning, The Center began operations in 2011 with Foster Connors as the executive director. A former youth minister, she applied for grants and studied the history and theology of mission work. From the outset, The Center wanted visitors not only to serve with local congregations but also to spend their evenings reflecting theologically about what they were doing and why. Where do you see God already at work in your community? On Tuesday morning, the Iowa teens found answers to those questions at Soaring Eagles Learning Camp, a weeklong summer academic enrichment program for students at West Baltimore’s Eutaw-Marshburn Elementary School. The camp is sponsored by Brown Memorial Park Avenue Presbyterian Church (U.S.A.), where Foster Connors’ husband, Andrew, is pastor. One group of the teens paired up with children to play math games, draw pictures and write stories. Another group led a healthy cooking class, helping children scoop raisins, sunflower seeds and Cheerios. 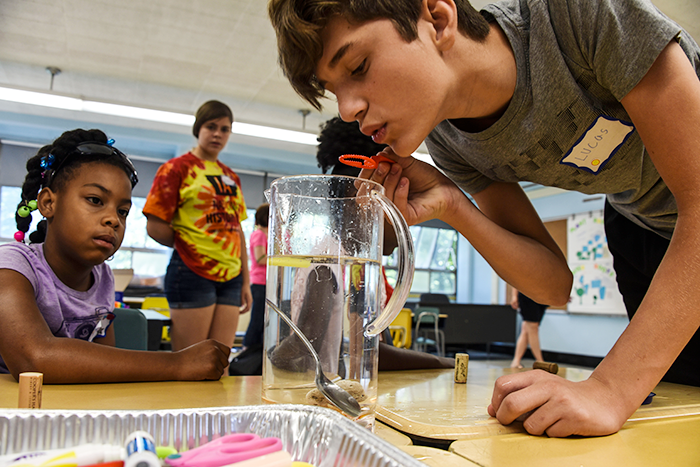 In a science classroom, a teen hoisted a bucket of water as excited campers huddled around, taking turns dropping various objects into the bucket to see which ones floated. Chrystie Adams, a retired schoolteacher, has directed the learning camp for seven years. Like many of the local volunteers, she attends Brown Memorial, which organizes all aspects of the camp, providing volunteers and donating books, food and other materials. Though only a few blocks apart, the church and the school illustrate the dividing lines the teens had discussed the night before -- and how they can be bridged. While the church sits in the prosperous and predominantly white neighborhood of Bolton Hill, the school is located in the mostly poor and black neighborhood of Madison Park. Just across from the school that morning, deflated balloons drooped from a tree, a memorial to one of the 97 people killed in Baltimore in the first six months of the year. Adams said her goal is for the children to feel loved and appreciated and to learn in a fun environment. Throughout the week, the teens, from Westminster Presbyterian Church in Des Moines, built a rapport with the Baltimore schoolchildren. They assumed the roles of older siblings, keeping the younger children engaged and on task. The group is accustomed to emotionally and spiritually intense mission trips, said Lisa Anderson, the youth director at Westminster Presbyterian. In past summers, the teens have traveled to Chicago and Miami to examine issues of race, class and gentrification, and to the Arizona-Mexico border to learn about and aid immigrants. “We’re always looking for a different approach to mission,” Anderson said. She was drawn to The Center’s emphasis on building skills to form similar programs at home. Oliver Carrell, 18, of Des Moines, said the walking tour of Baltimore reminded him of the racial and socioeconomic contrasts he had seen in Miami. The Georgia teens, from Covenant Presbyterian Church (U.S.A.) in Augusta, spent their week doing similar work, helping at a camp run by a coalition of Baltimore congregations. The Center currently has partnerships with 14 churches, mostly PCUSA, and several nonprofits where visiting groups can serve, including an urban farm and a homeless shelter. The partnerships are an essential part of The Center’s program. The partners are both anchors and models for the visitors, providing meaningful work opportunities and demonstrating how to launch similar programs in their own communities. 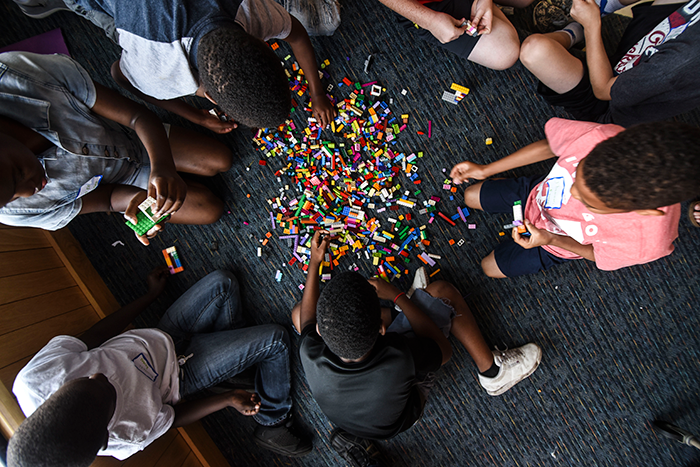 For churches with dwindling and aging populations, the young volunteers help provide the “hands and feet” needed to run summer camps and other projects. As the only full-time employees, Foster Connors and Lewellen stay busy year-round, handling marketing, forming partnerships with local churches, scheduling trips and raising money. Initially, the program received grant support from the presbytery and various Presbyterian groups, but it now supports itself with registration fees, donations, and workshop and consultation charges. Three interns -- two divinity school students from Columbia Theological Seminary and an education graduate student -- help run the program this summer. Most visitors are middle and high school youth groups, but college, young adult and retiree groups also attend. Most stay for a week, but some come for a weekend or a few days. The Center expects to host 25 groups this year, including 11 this summer -- a big change from the two or three annually for the first few years. 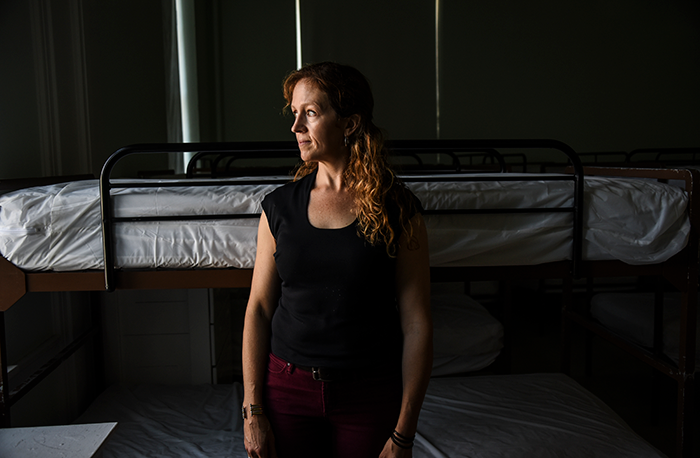 The groups are housed at The Center’s 40-bed facility in Baltimore’s Mount Vernon neighborhood. The building has two large dorm rooms, bathrooms (with showers), living and dining areas, and worship and teaching space. In the evenings, the groups cook and eat dinner together, then gather for prayer and guided reflection. Tuesday evening, after returning to The Center from the church camps, the teens from Iowa and Georgia dug deeper into Baltimore’s history of division. Visiting a series of prayer stations, they learned about political and business practices that had limited the lives of black Baltimore residents for generations: redlining, blockbusting, mass incarceration. They talked about the city’s chronically underperforming schools, the prevalence of drugs, cycles of violence and the connections among the three. How well does your church know the history that shaped your city? Should it? They also discussed inequality and racism broadly. The city’s poorest neighborhoods are nearly all black, with average lifespans about the same as in North Korea. The wealthiest areas are mostly white, with lifespans nearly a decade longer. Most importantly, the visitors were encouraged to return home with new eyes -- attuned to injustices and divisions in their own communities and looking for ways to combat them. 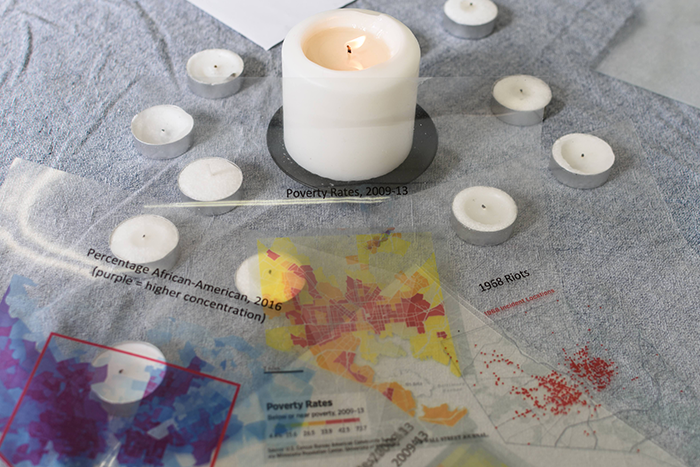 One evening during their stay at The Center, the Iowa and Georgia groups studied demographic data and maps of Des Moines and Augusta to parse lines of racial and socioeconomic segregation. For some, it was the first time they realized that their churches or schools were nearly all white. Soon, the Iowa teens were debating which grocery stores back home were the most segregated. What practices would help your church see more clearly the divisions and injustices in your community? “There’s only one African-American family in my neighborhood,” said one bewildered teen. On the final evening, the visitors learned how to talk with strangers about things that matter. Coached by The Center staff, they practiced asking open-ended questions, listening compassionately and having a conversation without dominating it. Foster Connors explained that listening is the critical first step in partnering with community members to meet local needs. In a closing prayer service, the teens shared moments during the week when they had experienced Jesus. One of the youngest talked about befriending one of the oldest campers, a boy just a year younger than he was. A girl said that when she urged the kids to tell people not to litter, one camper replied that she’d be shot if she ever suggested that in her neighborhood. 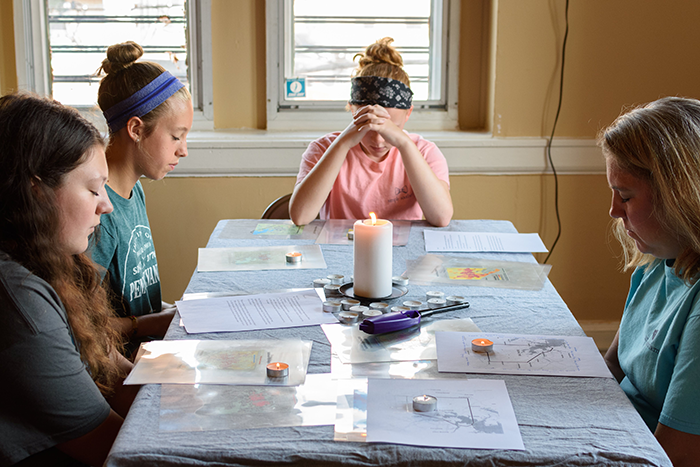 Teens from Eastside Baptist Church in Marietta, Georgia, pray before studying Baltimore maps during an early July visit to The Center. Photo by Lisa Howell and Tracy Watts. 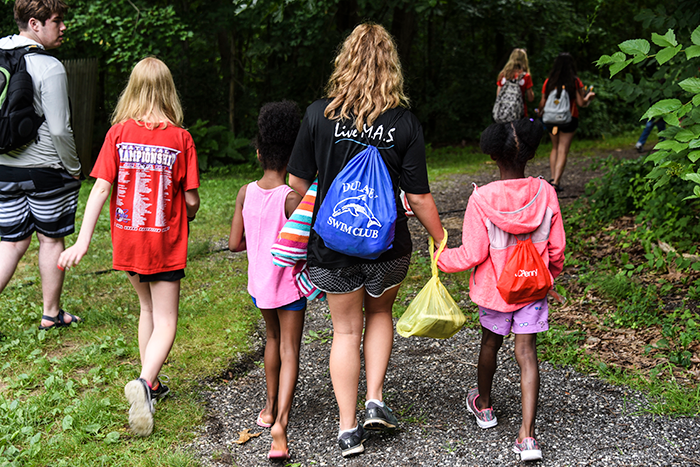 On the last day of camp, as the Baltimore children and Iowa teens lined up for lunch, they chatted about their week together -- especially their trip to a campground outside the city, where they played basketball, ran through fields and piled stones in a stream to make a swimming hole. The children’s parents, grandparents, siblings and friends were also invited to the lunch. Tamara Lee said her 7-year-old son, Darrell Sutton III, had come home each day bursting with stories. Camp had been a bright spot in an otherwise dull summer. Usually, she doesn’t let Darrell play outside for fear that he’ll be hit by a stray bullet. After lunch, as the teens and children said their goodbyes, a little girl flung herself into the arms of Kathryn Ikeda, 18. Ikeda, who will start college at the London School of Economics this fall, was still pondering all that she had learned about Baltimore’s history of poverty and structural racism. Is your congregation connected with people unlike themselves? How can it improve? What are the political and economic forces that shaped your city? How well does your church know that history? Should it?